The structure of South Africa’s labour force remains highly gendered. Women remain the likeliest to be unemployed and have a lower labour force participation and employment rate than men. Labour force participation (LFP) has grown for both men and women since the start of the Global Financial Crisis. Importantly, in both instances, the growth in the LFP since the crisis has been dominated by the growing numbers of those that are joining the unemployment line rather than the growth of those that have successfully secured employment. Notwithstanding, women have fared better than men in securing employment since the crisis. This is largely due to the fact that men dominate sectors that compete with international markets i.e. tradable sectors. These sectors are the most vulnerable sectors to declines in global aggregate demand. 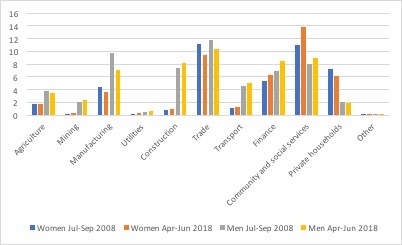 The manufacturing sector is one such tradable sector that is dominated by men; and incidentally many of the jobs lost by men are attributable to that sector. There are three trends that have emerged to feminise the crisis as experienced in the labour market and in the household. First, women have historically not been spared from the negative impact of the crisis in the male-dominated tradable sector, as the crisis in economic reproduction has a bearing on social reproduction. Both the work of Masoetsa and van Diel speak to the impact of de-industrialisation in the manufacturing sector on the black household on account of neoliberal trade and macroeconomic policy. The household’s ability to be resilient and stable in the face of economic crisis has increasingly relied upon state transfers. The burden has become most prominently felt by older black women within the household. Secondly, the prospects for decent work have deteriorated for both sexes as non-permanent or insecure work has dominated the conditions of employment. But women have experienced this trend more than men. There has been a 26 percent increase in insecure work employment for women since the crisis while insecure employment for men has increased by 15.4 percent. Thirdly, community and social services is a sector relatively cushioned from developments in international markets. It is one in which women dominate. It has experienced the largest employment absorption in general, particularly female employment absorption. 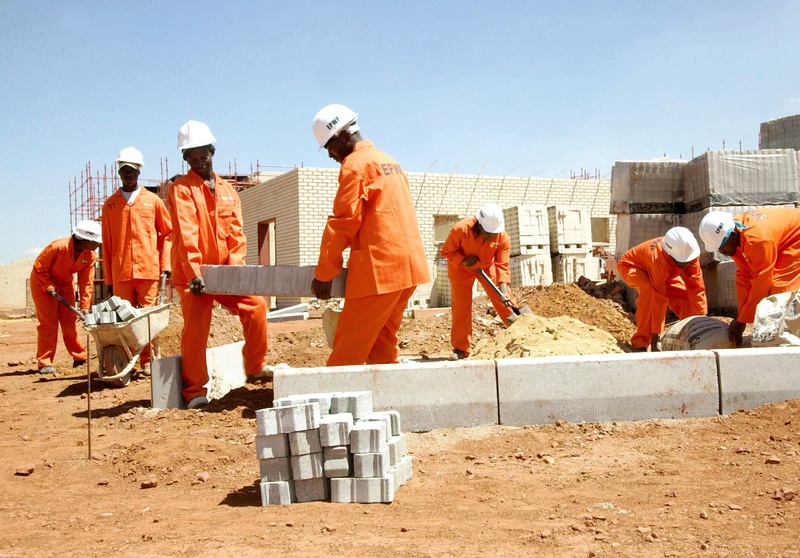 Arguably, the government’s Expanded Public Works Programme (EPWP) has contributed to the expansion in work opportunities provided by the community and social services sector. By the second quarter of 2018 (Apr-Sept), close to 800,000 work opportunities were created. The programme had by 2009 succeeded to meet its job target set at one million jobs. In fact the programme was partly responsible for absorbing much of the increase in labour force participation between 2004 and 2009. The performance of the EPWP underscores the manner in which the crisis has been feminised in the labour market. Indeed, women have been the main beneficiaries of the programme throughout the period as their contribution has ranged on average between 50 and 70 percent of total employment. However, the work opportunities created by the programme are highly insecure as they are temporary in nature; between four to six months. Moreover, the daily wage has not kept up with inflation: the real daily wage rate (which adjusts for inflation) has largely been stagnant throughout the period, in spite of an increase in nominal wages. It is for these reasons, amongst others, that critics of the programme have charged that it is nothing more than a cover for government’s austerity policy. This is because it has created a split labour market system in the public sector. On the one hand is a small fraction of permanent employees that enjoy benefits and decent wages. On the other hand, they are supported by growing number of EPWP workers, mostly women working under precarious conditions, with no benefits and poor wages. Indeed, the use of the EPWP programme as part of an austerity measure has become more pronounced post crisis. This appears to be corroborated by the slow growth rates in per capita expenditure on the “social sector”. In the “social sector”, we include health, education, social protection and housing and community amenities. Each of these make use of EPWP workers in different capacities. 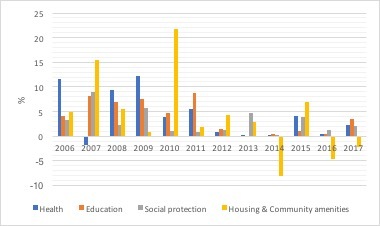 EPWP employment opportunities in the social sector have over the last three years increased (Figure 2). At the same time, rates of growth in per capita expenditures in this sector have declined (Figure 3). Importantly, these social sector employment figures are underestimated. The non-state state sector (Figure 2) also contains EPWP workers who are in the social sector. But they are separated in the figures because they are employed through NPOs and the community works programme rather than directly by the state. 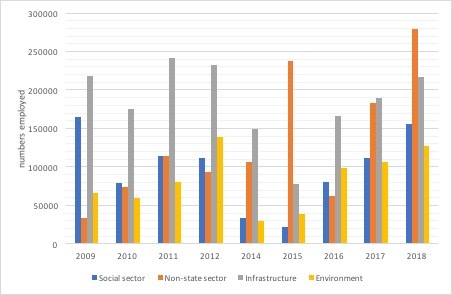 The declining growth rate of per capita expenditures targeted at the social sector does not bode well for society and the prospects of the economy at large. The situation has been made worse by an increasingly regressive take on tax policy which limits governments ability to raise revenue for social spending. The state increasingly relies on excise duties to raise revenue while the effective tax rate has been on the decline and corporate taxes remain unchanged. The dynamics in fiscal policy affect women acutely because, as the dominant group in the social sector work force, they experience the effects on female work prospects and conditions. In addition, austerity measures in the public health and education system not only affect working class women’s reproductive rights. They also affect their ability to participate in the work force. Women disproportionally absorb the burden of unpaid social care (for the young, the old, the sick and the disabled). With more resources in the social sector mobilised progressively, that social care would have been provided by the state. Indeed the EPWP is just a waste of tax payers money, because this workers are not sustain by given this work. EPWP must also be absorbed by the government particularly in local municipalities in order to provide services to its residence. EPWP should not be used as a stats tool for reporting small gains in job creation. The mentality of this government is to exploit people South Africa, through this programmes.